Need a love gift? Name a star! Feel good knowing you’ve given the most original love gift in the universe! Buying a gift for my loved one is a challenge every year. Luckily, I happened to read in a newspaper about giving a star! I found this the perfect gift to give my loved one, and I registered this star immediately. Dear OSR, Let me first of all say that I am absolutely overwhelmed by the speed, efficiency and courtesy of your service. I recently ordered the star love gift for my boyfriend on our first anniversary. David was so happy and touched by this thoughtful gesture. I recommend your site to anyone who is looking for the eternal love gift to their loved ones. Thanks again! I found the ideal gift for my sweetheart at OSR. I could not have imagined a more original and nicer present for him. The pack was neatly delivered to him on the day I specified! I just wanted to say thank you and your team for sending the most personalized love gift and making my husband’s birthday so very special. I was looking for something unique on his birthday. It was quite by chance that I came across your site and realized that this is exactly what I was looking for. The best part is Nick loved my unique love gift and keeps on raving about it to his friends. Thanks OSR! Wow! Thank you! I have received my order promptly from you guys just in time for my boyfriend’s birthday. He loved my unique love gift as an eternal symbol of our love. Best of regards and keep bringing smiles to people’s faces! I was with my girlfriend on the beach and she told me about your site. I thought it was a great idea so I ordered a star under her name for her. It’s a great idea that is super awesome for presents and memories. I highly suggest it! At first I really wanted to use this service. Because I think this is a kind of very special gift. The payment and delivery was very easy to make! And I have a little problem with my package. So I required to staff to change my package. My package was already ready for delivery, but they changed my package so nicely. And I got a great feeling from their kind service. If i have another chance to use this service I will use this site again, definitely!! The gift will be delivered next week, I can not wait to give this to him! I think he gonna like this present very much, and I hope so. You are the best!!! Thank you so much! I’m so excited to receive the certificate and present it to my significant other! Thank you for making it happen! It is a easy and quick way to surprise your love one. I strongly recommend this website. True love is endless, just like the stars in the universe. 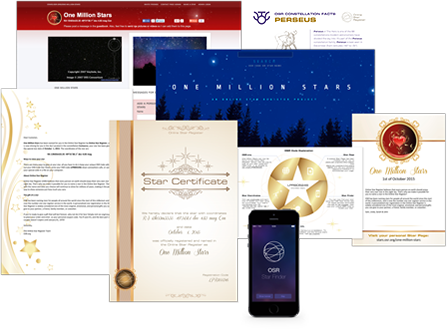 Show your undying love for that special person in your life by naming a star in the Online Star Register. A love that will last through the ages deserves to be immortalized in the heavens. 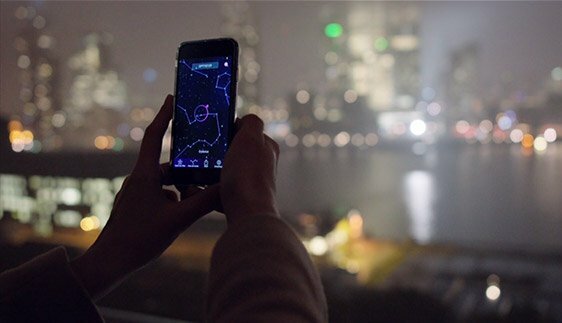 There’s no better way to make sure your love endures than with a specially named and dated star in the night sky! 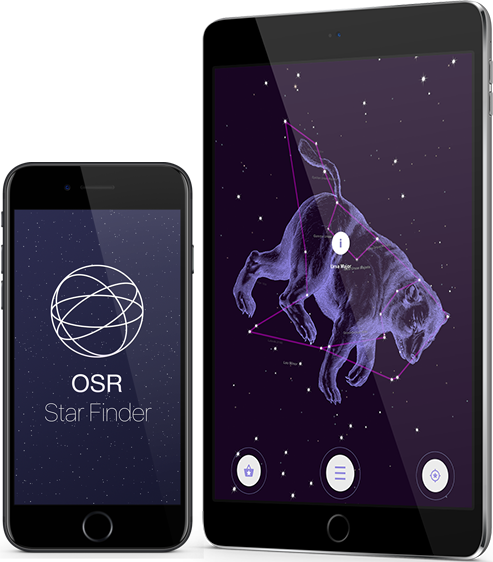 No matter which of the gift options you choose, they all come with the ability to find your new star in the sky with the breathtaking One Million Stars project and with the OSR Star Finder App. Everything about the gift you choose is completely customizable, down to the love-themed gift wrapping. 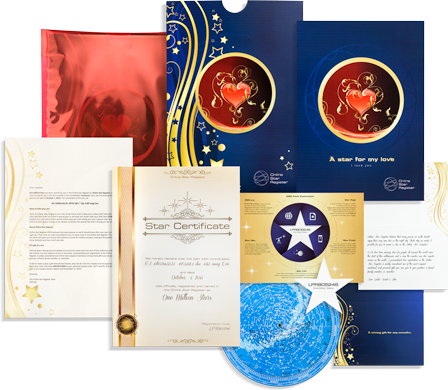 The two of you will be able to share your love star with your children and grandchildren. 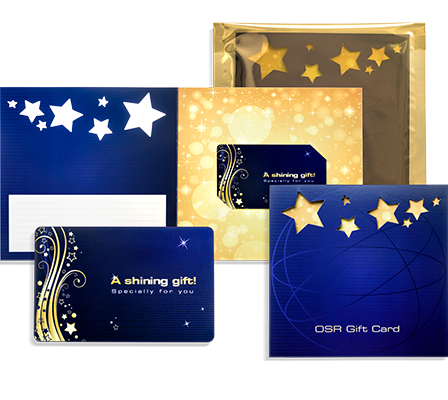 As OSR dreams up new and exciting ways to view your star, they will automatically be added to your original gift pack for FREE.